Home to roughly 90,000 hard-working residents, the City of Lynn, Massachusetts, is a vibrant community with a rich history. This history, which parallels much of New England’s history, is preserved in its museums, libraries, and historical society. This commercial and urban manufacturing center is the largest city in Essex County and is culturally diverse and densely populated. A naturally beautiful place, Lynn sits on the northern shore of Massachusetts Bay and is only nine miles north of Boston on the Atlantic coastline. 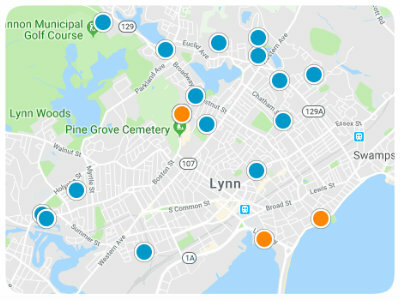 Lynn is bordered on the east by the Atlantic Ocean and Swampscott, on the west by Lynnfield and Saugus, on the north by Salem and Peabody, and on the south by Revere and Nahant. Beyond its rich history and fantastic location, Lynn also boasts a long list of desirable amenities and attractions. Among the most popular are Lynn Heritage State Park, Lynn Memorial Auditorium, Manning Field, Frasier Field, Lynn Woods, Gannon Municipal Golf Course, and many beautiful lakes and ponds. One such pond is Sluice Pond. Sluice is roughly fifty-acres in size with an average depth around eighteen feet and a maximum depth of around sixty feet. Summers near Sluice bring boats and water skiers, canoes, kayaks, paddleboats, and seemingly endless opportunities for other water activities. Sluice Pond is just two miles northwest of the heart of Lynn and may be the city’s best-kept secret. Prospective homebuyers wanting to escape the hustle and bustle of urban life will love the peaceful ambiance of this fairly secluded recreational gem. Sluice Pond is buffered from commuters and other traffic by businesses and residences facing Route 129. It is located across the road from Lynn Woods, the country’s second-largest urban park, and Gannon Municipal Golf Course. Beneath the pond’s towering oak, elm, and maple trees, there are 165 homes on Sluice Pond. Sluice Pond real estate includes a few multi-family homes, bungalows, and single-family homes. This is an exceptional waterfront community in Lynn, but it certainly is not the only option for homebuyers. Flax Pond is another popular waterfront community, as is Goldfish Pond. If you would like to learn more about Lynn, Massachusetts ponds and the homes for sale around them, please contact us so we can assist you.